When researching a breed for compatibility, there needs to be an understanding of what makes a breed strong, as well as the variation within each breed—understand that traits were selected to improve lines within a breeding program. It should be noted that there can be nearly as much variation within a breed as there is between breeds. Doing your research on both the breed and the specific breeder line will allow you to better meet your needs based on how each dog behaves in both social and hunting situations. The Boykin Spaniel will generally quarter at a moderate pace in front of the hunter to track birds by scent and sight. They are known for their hesitation while tracking before flushing aggressively. They are versatile hunters with very keen noses and a strong, natural desire to retrieve. Boykins are fantastic swimmers. The Boykin Spaniel is a medium sized breed with a coat that is generally dense and wavy in solid liver or brown. Their coat is somewhat shorter than other Spaniels and may be smooth in some cases. Tails are generally docked to 1/3 of full length. Height usually ranges from 14 to 18 inches from the ground to the highest point of the shoulders, and weight usually ranges between 25 and 40 pounds. The typical Boykin is friendly, affectionate, and usually adjusts easily to a family setting. They are enthusiastic playmates and will require activity to remain content. The Brittany is a close working pointer with natural hunting and retrieving ability. While not large in stature, they have the speed and agility to cover a lot of gro und. They are a tough and durable breed with skin and coat built to resist punctures and tears in thick cover. The Brittany is a medium sized breed with a coat that is generally dense and wavy in orange and white, or liver and white patterns, often with some ticking. Tri-colors are also found as liver and white dogs with orange markings on eyebrows, muzzle, cheeks and under the tail. Tails are often docked either completely or to a length of no more than approximately four inches. Height usually ranges from 17 to 21 inches from the ground to the highest point of the shoulders, and weight usually ranges between 30 and 40 pounds. Generally, the breed produces a very active and alert dog with a good disposition. A very outgoing nature makes the Brittany an excellent upland hunting companion. They will make good house dogs provided they have sufficient exercise. The Chesapeake Bay Retriever is a tough breed with skin and coat built to resist quite low temperatures in icy water. They are a powerful versatile hunting breed with natural retrieving ability that should stay within range. Jaws are large and powerful for retrieval of large game birds. A large breed with a coat that is generally thick and short with a heavy undercoat that is well suited to wet, cold conditions. Color usually ranges from dark sedge to lighter brown shades, and hair coat is slightly wavy. Tails are left full. Height usually ranges from 21 to 26 inches from the ground to the highest point of the shoulders, and weight usually ranges between 55 and 80 pounds. Chesapeake Bay Retrievers are usually bright and happy dogs with a great love for water. While fairly large in stature, they should remain fairly lean and agile. The breed is generally very loyal and protective of its home and family. Obedience training is genuinely considered essential with this breed as they are prone to exhibiting alpha characteristics. Originating in the 1800's, the Curly-Coated Retriever is one of the oldest of the retriever breeds. They are versatile hunting retrievers that are well rounded multi-purpose gundogs equally adept on land or water. Like most retrieving breeds, the Curly will range in front of the hunter to flush upland birds within comfortable gun range. The Curly-Coated Retriever is generally considered to be the tallest retriever breed and is somewhat "leggy" in appearance. The breed is very easily recognized by its short, thick coat of tight curls that is solid black or liver in color. Tails are left full. Height usually ranges from 23 to 27 inches from the ground to the highest point of the shoulders, and weight usually ranges between 60 and 80 pounds. Curly-Coated Retrievers are good companions that enjoy being part of family socialization. They will be calm indoors and energetic outdoors provided they get outdoor activity time. This breed does best living indoors with frequent opportunities to play outdoors. The English Cocker Spaniel is trained to quarter within comfortable gun range in front of the hunter to flush upland game birds. While small in stature, they were bred to penetrate and hunt dense upland cover. They are versatile hunters but generally prefer moderate temperatures for waterfowl hunting. The English Cocker Spaniel is a medium sized breed with a coat that is medium length and either flat or wavy. The coat color can be solid black, liver, red, or a combination of white with black, liver or red ticking. Coats are generally shorter and ears smaller in the field bred lines. Tails are generally docked to 2/3 of full length on field lines. Height usually ranges from 15 to 18 inches from the ground to the highest point of the shoulders, and weight usually ranges between 25 and 35 pounds. The typical English Cocker is friendly and well known for a merry disposition. They tend to have moderate activity levels in a home environment and even field lines tend to avoid hyperactivity. They generally acclimate very well to a variety of home environments. The Pointer is a very hard driving hunter known to be a tireless worker with great work ethics. They are independent and enthusiastic hunters with great range, and they work well in the field with other dogs. They generally exhibit natural hunting instincts at a very young age and have the abilities to cover larger areas of ground. Pointers are generally bred for upland hunting in warmer climates with a need to cover larger areas. The English Pointer (aka Pointer) is a large breed with a coat that is generally very short and smooth. Color is primarily white with liver, orange, black or lemon patches or speckles. They are generally lean but very well muscled. Tails are rarely docked and provide distinction when on point. Height usually ranges from 21 to 24 inches from the ground to the highest point of the shoulders, and weight usually ranges between 45 and 75 pounds. Field lines tend to run larger than show lines. They are very loyal and tend to make excellent companions but must be kept active. While loyal and affectionate, field bred lines may exhibit restless traits that make them less than ideal as indoor pets unless exercised extensively. The English Setter (aka Setter) is a quick and efficient worker with an excellent nose and ground speed that was bred specifically for upland bird hunting. They are graceful hunters that combine agility with stamina to cover a lot of ground. They are energetic dogs from a long, rich history of finding and pointing upland birds. The English Setter is a large breed with a coat that is generally long with feathering at the ears, tail and underside. Base color is usually white with secondary colors including orange belton (speckling), blue (black) belton, liver belton and yellow belton. Tri-color belton are also found as blue belton dogs with tan markings on muzzle, eyes and legs. Tails are generally left full. English Setters generally produce fewer Dual Champions since the more effective field sizes, colors and coat characteristics tend to vary from desired show characteristics. Height usually ranges from 23 to 27 inches from the ground to the highest point of the shoulders, and weight usually ranges between 45 and 75 pounds. They are a gentle and affectionate breed with a very mild disposition that tend to train better with positive reinforcement. They do well in a home environment as they tend to mellow indoors and take on a friendly "couch potato" mentality provided they are kept active when outdoors. The English Springer Spaniel will generally quarter in a zig-zag pattern in front of the hunter to "spring" and flush upland game birds. They should stay within comfortable gun range and will retrieve to hand. The English Springer breed is noted for both upland and waterfowl hunting. The English Springer Spaniel is a medium sized breed with a coat that is generally dense and wavy in black and white or liver and white patterns often with ticking. Tri-colors are also found with the addition of tan markings on eyebrows and on the muzzle. Tails are fully docked in show lines but are generally docked only a few inches on field lines. Height usually ranges from 18 to 21 inches from the ground to the highest point of the shoulders, and weight usually ranges between 40 and 50 pounds. The typical Springer is friendly and affectionate and usually easy to acclimate in a family setting. They are very energetic and generally exhibit more speed than other Spaniel breeds. Their playful nature combined with great stamina make them excellent sporting companions. Originating in the 1800's, the Flat-Coated Retriever became very popular as a "Gamekeeper's Dog". They are versatile hunting retrievers that are well rounded multi-purpose gundogs equally adept on land or water. Like most retrieving breeds, the Flat-Coat will quarter in front of the hunter to flush upland birds within comfortable gun range. The Flat-Coated Retriever is a large breed with a thick, medium coat that is single layered and is solid black or liver in color. Although thick, the coat tends to be very smooth with feathering at the legs, tail and chest. Tails are left full. Height usually ranges from 22 to 25 inches from the ground to the highest point of the shoulders, and weight usually ranges between 55 and 75 pounds. Flat-Coated Retrievers are cheerful companions that are generally calm indoors and energetic outdoors. They are an intelligent breed that is easily trained although they tend to do best without harsh correction. Their social natures make them great companions and they tend to get along well with other animals. This breed does best living indoors with frequent opportunities to play outdoors. The German Shorthaired Pointer (GSP) should range and hunt within a comfortable distance from the hunter. They work well with other dogs in the field and should honor instinctively. They are a versatile and popular hunting choice due to their ability to hunt enthusiastically on both land and water. The GSP is a large breed with a coat that is generally very short, sleek and dense. Color should be liver, liver and white or black and white, solid, patched and ticked or roan. They are generally lean but very well muscled. Tails are generally docked to roughly forty percent of full length. Height usually ranges from 21 to 25 inches from the ground to the highest point of the shoulders, and weight usually ranges between 45 and 70 pounds. The German Shorthaired Pointer is very energetic, smart and eager to please. They are very loyal and make excellent family and hunting companions provided they are kept active. They exhibit excellent speed and natural hunting instincts. The German Wirehaired Pointer is an all-around gun dog that is able to hunt many types of game on almost any terrain. It is a versatile hunter that will track, point, and retrieve on both land and water. They are sturdy dogs that are well muscled and tend to be very determined hunters. The German Wirehaired Pointer is a large breed with a wiry coat that is the breed's most distinctive feature. Color should be liver and white or black and white, ticked or roan, although an occasional solid liver color is possible. Tails are generally docked to roughly forty percent of full length. Height usually ranges from 22 to 26 inches from the ground to the highest point of the shoulders, and weight usually ranges between 55 and 70 pounds. The German Wirehaired Pointer is very affectionate and loyal to those it knows although they can be somewhat aloof to strangers. They are very loyal family and hunting companions but must be socialized at an early age and kept very active if kept in a home setting to avoid restlessness. GWPs are often the hunting breed of choice for people who suffer allergies to hair from dogs. Golden Retrievers are versatile hunting retrievers that are well suited to cold hunting conditions due to an outer coat that is dense and water repellent. They are a tough and durable breed with good speed and agility and a great love of water. Goldens will quarter in front of the hunter to flush upland birds and should stay within comfortable gun range. They live to retrieve. The Golden Retriever is a large breed with a medium length, feathered coat that is double layered and generally ranges from cream to golden in color with red hues possible. A deeper red color is also possible, but not preferred. Tails are left full and should be straight. Height usually ranges from 20 to 24 inches from the ground to the highest point of the shoulders, and weight usually ranges between 50 and 80 pounds. The Golden Retriever is one of the most popular family companions in the world due to their exceptionally social nature. Their popularity as pets has resulted in some deviation from hunting roots so the search for a hunting companion should focus on clear hunting lines. They are intelligent, very eager to please and easily trained. While not aggressive, they can be good watchdogs because they will raise an alarm with the arrival of strangers. The Gordon Setter should range and hunt independently some distance from the hunter. They are not generally fast but are patient and have very good stamina. They exhibit natural abilities to point and retrieve and are well suited to hunt in adverse weather conditions. The Gordon Setter is a large breed with a coat that is generally glossy, soft, wavy and black and tan in color. It differs from other Setters in its more robust stature, and it is the only black and tan Setter. Tails are well feathered and are left full. Height usually ranges from 23 to 27 inches from the ground to the highest point of the shoulders, and weight usually ranges between 50 and 80 pounds. Gordon Setters are energetic working dogs that tend to be calm household companions when properly exercised. They are somewhat slow to mature and will exhibit puppy characteristics beyond three years of age. They are generally good with children and other pets. The Irish Red & White Setter is a cousin to the Irish Setter. The Red & White is much more commonly used as a gundog than its cousin and has been revived for this use in recent years. They are known for a keen nose and can hunt a wide variety of terrain in any climate. The Irish Red & White Setter is a large breed with a coat that is long and silky. Base color is mostly white with deep red patches and occasional flecking. Tails are left full. Field lines generally run smaller and leaner with somewhat shorter coats. Height usually ranges from 22 to 26 inches from the ground to the highest point of the shoulders, and weight usually ranges between 50 and 75 pounds. Red & Whites are very loyal and do well with children and other animals. They do best in an active household with plenty of opportunity to romp and play. Though not considered an extremely quick learner, the Red & White is a very swift hunter and makes a very good finished hunting companion. The Italian Spinone (aka Spinone Italiano) is a large, rugged gun dog with a thick, wiry coat that is well suited for protection in dense upland grasses or cold water. They are sturdy and determined hunters with a close-working, deliberate style. While not fast or flashy, the breed will naturally point and retrieve and is gaining popularity due to its unique appearance and reliability in the field. The Spinone is a large breed with a very distinctive appearance. Color should be solid white, white and orange, orange roan with or without orange markings, white with brown markings, or brown roan with or without brown markings. Most color combinations are ticked or roan although an occasional solid liver color is possible. Tails are generally docked to roughly fifty percent of full length. Height usually ranges from 22 to 27 inches from the ground to the highest point of the shoulders, and weight usually ranges between 60 and 85 pounds. The Spinone is extremely mild mannered and make excellent companions. They are intelligent and easily trained although they can be stubborn and may need a firm training hand. Spinones are very calm indoors and transition easily from house to hunt. Labrador Retrievers, or Labs, are versatile hunting retrievers that are well suited to adverse weather conditions and very cold water. They are a tough and durable breed combining a sturdy build with good speed and agility. Labs will quarter in front of the hunter to flush upland birds and should stay within comfortable gun range. The Labrador Retriever is a large breed with a smooth, short coat that is double layered and is solid black, yellow or chocolate in color. Claims are made of labs that are silver in color but this is not recognized by the AKC and is considered to be simply a shade of chocolate. Tails are left full. Height usually ranges from 21 to 25 inches from the ground to the highest point of the shoulders, and weight usually ranges between 55 and 85 pounds. The Labrador Retriever is the most popularly registered breed in the world. This is generally attributed to their extreme versatility combined with their exceptional social skills. They are an intelligent breed with a strong work ethic that tends to be easily trained. Their social natures make them great companions but less capable guardians. The Llewellin Setter is an unrecognized (by the AKC) strain of English Setters with very similar hunting characteristics. While not a separate breed, the Llewellin Setter is a pure and distinct bloodline of the English Setter breed that was bred for superior performance in the field. Build, coat length and color are generally not distinguishable from a standard English Setter. They are a gentle and affectionate breed with the same gentle, inquisitive disposition appreciated in all English Setters. They do better in a home environment when they are kept active and allowed to spend time running outdoors. Nova Scotia Duck Tolling Retrievers (or "Tollers") are hunting retrievers well suited to cold hunting conditions. They are a compact and sturdy breed that is very active and agile. Tollers were bred to hunt by frolicking and retrieving along the bank to "toll", or lure, curious waterfowl. While excellent waterfowl hunting companions, they are equally adept in the uplands. The Toller is a medium breed with a medium length, mostly straight, coat that is double layered and water-repellent. Color is various shades of red with lighter featherings and white markings on the tip of tail, feet, chest and blaze. The head should be wedge shaped with tails left full and slightly curved. Height usually ranges from 17 to 21 inches from the ground to the highest point of the shoulders, and weight usually ranges between 35 and 50 pounds. The Toller is somewhat more reserved than some other Retriever breeds but still makes an excellent family companion. They are intelligent, playful, eager to please and easily trained. They have a naturally inquisitive nature and generally get along very well with other pets. Although not classified as a Sporting Breed, the Poodle (Standard) originated in Germany as a water retriever hundreds of years ago. While not generally used for hunting today, the breed retains many of the qualities that made it attractive to hunters. The Poodle is intelligent, very active and considered easy to train. The Poodle has a coat that is dense, heavy and tightly curled or corded. The coat is hypoallergenic, and does not shed, but will require frequent and extensive grooming. Poodles sport a distinctive hair clip that, while considered stylish, originated as a means to keep vital body parts warm while providing a leaner profile to move easily through water. Poodles can be a variety of colors including white, black, brown, apricot and gray. Tails are often docked to half length but may be left full. Height usually ranges from 22 to 26 inches from the ground to the highest point of the shoulders, and weight usually ranges between 45 and 70 pounds. Poodles are generally sociable and will remain largely inactive while indoors. They do require outdoor exercise, however, as they are a naturally active breed. They generally get along well with people and other pets and have been known to do well as guard dogs. The Pudelpointer is a versatile hunter bred for a combination of a very good nose plus speed, endurance and hunting desire. They will exhibit natural pointing and hunting instincts and will enthusiastically retrieve on land and water. The Pudelpointer is a large breed with a dense, wiry coat that is known for very limited shedding. Color should be liver or chestnut but black is also seen on occasion. Tails are generally docked to roughly 2/3 of the original full length. Height usually ranges from 21 to 26 inches from the ground to the highest point of the shoulders, and weight usually ranges between 44 and 66 pounds. While not a popular breed in the United States, the Pudelpointer is becoming more widely recognized due to its combination of hunting ability and disposition. The breed is generally viewed as an excellent companion in a home environment and is easily trained. The Red Setter is an upland bird dog with a high prey drive, work ethic, and stamina. While registered as Irish Setters, they are referred to as Red Setters to acknowledge their distinct differences. Red Setters are a product of an extensive restoration initiated in the 1950's. They have a racy ground pattern, can cover extensive range, and are known for their high intelligence. 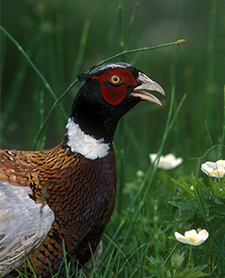 They are at home in pheasant fields, grouse woods, and on the prairies, and tend to break out easily and at a young age. 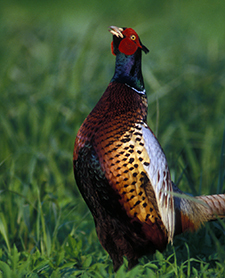 They are an excellent choice for the hunter who has a variety of upland hunting destinations. Most specimens are natural backers and retrievers. Red Setters are smaller than the traditional Irish setter. They tend to have less feathering, and will often have white on the chest, feet, face, and occasionally tail. Most lines of Red Setters point with extreme style, with the high tail and high head typical of American bred pointing breeds. Red Setters are typically in the range of 40 to 50 pounds, with females usually slightly smaller than the males. Red Setters are very "people" oriented and tend to do much better when co-existing as companion dogs with their hunting family. They do well as house companions, provided they are provided plenty of exercise. They tend to become very loyal and attached to their human companions, and make excellent house dogs as well as hunters. The Small Munsterlander is a very versatile hunter that will flush, point, and retrieve on land and water. Their numbers are small in the United States but they are much sought after by hunters that perceive them to be one of the most versatile and easily trained gundog breeds. The Small Munsterlander is of medium size with a soft, medium length coat that provides protection during the hunt but may require grooming after. Color is generally large patches of brown or black on a ticked or solid white background. Tails are generally left full. Height usually ranges from 18 to 22 inches from the ground to the highest point of the shoulders, and weight usually ranges between 35 and 55 pounds. The Small Munsterlander is a very quick study in training that generally performs best for a patient trainer with a very consistent approach. They can be strong willed but are excellent companions and easily make the transition from house pet to driven field hunter. Small Munsterlanders usually get along well with other pets provided they are given the freedom to play. Vizsla's are very energetic working dogs that are robust but rather lightly built. They exhibit natural abilities to point and retrieve and show a genuine love of water. They do not have an undercoat, however, and are not particularly well suited for very low temperatures. The Vizsla is a medium sized breed with a coat that is generally short and smooth in a golden rust color although they can tend toward a deeper red. Tails are generally docked to a length of roughly two-thirds of the natural length. They are generally lean but well muscled. Height usually ranges from 20 to 25 inches from the ground to the highest point of the shoulders, and weight usually ranges between 45 and 65 pounds. Vizsla's tend to be very bright and social dogs that thrive on attention and affection. They are known as a one owner dog because of their loyalty. They take training well but must be handled carefully as they generally exhibit sensitive personalities. They are poorly suited to be outdoor dogs but will thrive indoors provided they are sufficiently exercised. The Weimaraner is a good all purpose gun dog that is able to hunt many types of game. 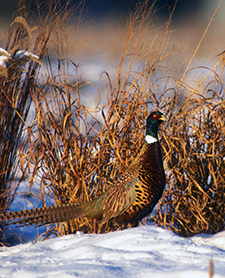 It is a versatile hunter that was originally bred for hunting large game but became more focused on upland game as the popularity for large game hunting declined. Prey drive is strong and instinctive, so training should begin at a young age to shape their general hunting instincts. The Weimaraner is a large breed with a coat that is generally short and smooth in a mouse-gray or silver-grey color. Tails are generally docked early to a length to no more than one-third of the natural length. Height usually ranges from 23 to 27 inches from the ground to the highest point of the shoulders and weight usually ranges between 55 and 80 pounds. A fast and powerful breed, Weimaraners are very active and are known for their stamina, so they must be kept active in a family setting. They tend to be less social toward strangers and can be very protective. They can also be territorial and should be socialized early to avoid aggression. The Wirehaired Pointing Griffon is an all-around gun dog that is able to hunt many types of game from rabbits to quail. It is a deliberate hunter that will track, point, and retrieve on land and water and stay within easy range of the hunter. Their thick, heavy coat is well suited to hunting in very cold temperatures and they tend to prefer cooler hunting climates. The Wirehaired Pointing Griffon is a medium sized breed with a thick, wiry coat that is very distinctive. Color should be steel gray with brown, orange, white or, occasionally, black markings. Tails are generally docked to roughly forty percent of full length. Height usually ranges from 20 to 24 inches from the ground to the highest point of the shoulders, and weight usually ranges between 40 and 60 pounds. The Wirehaired Pointing Griffon is affectionate and loyal to the immediate family but can be standoffish with strangers. They make very good watchdogs. They must be socialized early and kept very active in a home setting to avoid restless behavior. Their coat will shed very little but must be stripped to encourage new hair growth.